HOUSTON — Members of the "Cajun Navy" gathered in the parking lot of a sporting goods store in this city's Summer Meadows neighborhood early Monday, bleary-eyed, wearing waders and smoking cigarettes or chewing tobacco — but, most important, towing boats. The ragtag crew of Louisiana natives flowed into Houston from all over the Pelican State in customized trucks and SUVs to rescue Texans trapped by the rising floodwaters brought by Hurricane Harvey. They arrived with jon boats, fishing boats, row boats, airboats, even canoes and kayaks. "We don't wait for help. We've been there before," said Clyde Cain, 54, who helped start the Cajun Navy outside New Orleans in the wake of 2005's Hurricane Katrina. "If we weren't out here doing this, then there might not be any other rescue units. I mean, we do it because it's what we're supposed to do — we're supposed to help our neighbors." Some members of the group had started rescuing stranded folks Saturday night after driving nonstop without so much as a nap. They immediately set to work, all while being pelted by a chilly, unrelenting rain. Despite the unpleasant conditions, a dozen Louisianans huddled up outside an Academy Sports and Outdoor store later on Monday morning to plan their move to a position north of Sheldon Lake, where a number of homes were flooded. "Should we bring a gun?" one man, who did not want to be identified, asked after Cain warned that a rescuer had been shot at and a few openly worried that their boats might be stolen. "It's open carry," Cain responded. Some took that as a green light to pack heat. The group then got into their vehicles and headed north as a caravan on Sam Houston Tollway to the next dock point — formerly a highway off ramp. There they lined up their boats for entry and waited, but it soon became clear that no one was moving. Cain said he was waiting for directives from local emergency personnel — they knew the lay of the land and could provide much needed logistics. Also, the water level was slightly low, a bit more than a foot and a half to the bottom, the road. Some of the rescuers needed at least a 2-foot clearance to put their vessels in the water. For 90 minutes, the group stood out in the rain next to their boats, as if waiting for the water to rise to conduct rescues. "If you go out there now," Cain warned, "you're on your own." Cain is one of the main organizers behind this most recent trip of Cajun Navy members, having long run the Louisiana Cajun Navy Facebook group — which has grown from more than 20,000 likes to nearly 90,000 since Harvey hit as a Category 4 hurricane. And stranded Texans have been posting their pleas for help since early Friday. Now those cries for help are disseminated by an administrator to the group via a walkie-talkie app on their phones. "We're all keyed into one station on our phone, so we know where everyone is at at all times and we got someone who tells us who needs help and where they are," said Charlotte Kelsey, who was helping with some of the organization at the initial staging area. Although leaders called for patience, members of the Navy grew restless. Individual sailors split off to find entry points they could safely dip their boats in. A few found a spot not far away on a westbound lane on Interstate 10. 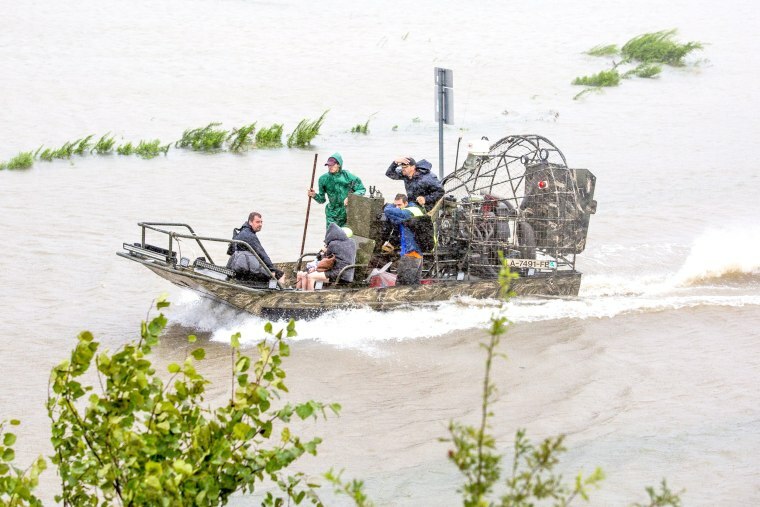 There, Sally Coiner, 28, provided medical attention to victims as members of the Cajun Navy set jon boats and airboats into a flooded section of highway not far from East Houston Regional Medical Center. Coiner had driven from Virginia with her husband to join up with the Louisiana crew. They'd heard a report that some patients and members of law enforcement were trapped in the hospital. "I put 12 people in two pickup trucks, somehow," Coiner said. "One was just a guy in his pickup, and I put four friends and two puppies in that one, and then I put a family in there — kids in the back — and then we added two older men to that. "I've also seen a lot of people walking to safety, but they're not drowning, so that's the idea," she added. Among a handful of boats, Coiner and others said they had rescued nearly a dozen people from the hospital. But after the members of the Cajun Navy went out, they returned frustrated and slightly disheartened. They'd come upon a number of people who were trapped in their homes amid the rising water but who remained unconvinced that they needed rescuing. "You got people who don't want to leave their house or people who want to leave but can't for whatever reason," said Andre Barnes, 24, a newly minted member of the Cajun Navy who wielded an AR-15 rifle. "These people are going to be stranded for God knows how long." This smaller group of Cajun Navy members huddled up once again — soaked, exhausted and shivering — and decided they'd try another spot a little farther north. "We'll keep going for as long as it takes," Barnes said.